In modern times, farming’s gone from humanity’s top job to a sliver of the economy—a trend that continues today as fewer young people choose to farm. For every farmer under 35 there are 6 over 65, and a quarter of today’s US farmers will retire by 2030. But we all still have to eat. Though the article argues we’re in dire need of more human farmers, it forgets to mention one of the primary drivers of modern agriculture—automation. It now takes far, far fewer farmers to supply food for the rest of us. Along with reduced crop failure and improvements in how much we can grow per acre of soil, we’ve also steadily swapped the sweat of our brow for the oiled whir of machinery. And that trend continues. One recent example? Japan’s new automated indoor lettuce farm. Growing lettuce isn’t the flashiest occupation, but it gets a little flashier when you do it with the press of a button. Japanese company Spread is expanding its indoor farm and more fully automating it. People will plant the seeds, but a robotic system takes it from there. Conveyor belts equipped with robot arms will water, trim, re-plant, and harvest crops. Sensors will monitor humidity, CO2, light, and temperature—automatically adjusting the indoor climate to make sure the lettuce is happy. 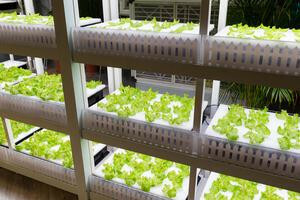 “The seeds will still be planted by humans, but every other step, from the transplanting of young seedlings to larger spaces as they grow to harvesting the lettuces, will be done automatically,” according to JJ Price, Spread’s global marketing manager. Compared to their current indoor farm, Spread’s new facility aims to reduce energy costs by a third with LEDs. Automation will reduce labor costs by half. And by recycling 98% of their water, Spread says their pesticide-free lettuce consumes 100 times less than conventionally grown lettuce. Once operational next year, the farm will more than double production from 21,000 heads of a lettuce a day to 50,000 a day, and they’re aiming for half a million a day in five years. While indoor farms offer a more controlled setting, farm robots aren’t limited to them. Self-driving tractors have been in fields for years. A farmer usually has to be in the cab, but they can focus their attention elsewhere, doing business on a laptop for example. (And full autonomy is coming.) Other kinds of farm robots abound. Robot arms can prune plants or spot and pick ripe fruit. Autonomous drones can skim fields and monitor crop health from above. All this farm automation isn’t new; it’s the continuation of a long trend. Robots will take over some jobs from people, but fewer of us are choosing to farm too. If your focus is elsewhere, no problem, farm robots like these ones will make sure you still eat your greens.